Section A lists the LAYOUTS in Phoenix AZ, that are OPEN TO THE PUBLIC — at least ONCE per week. This list is organized by CITY. Some of the layouts are “ride-on” amusement park size. Page 2 shows these same layouts, but organized by SCALE. Section B lists additional layouts that are open to the public, but less than once per week. Section C lists the remaining model RR groups that do not have a permanent layout. Section D lists some other Phoenix-area model RR resources. 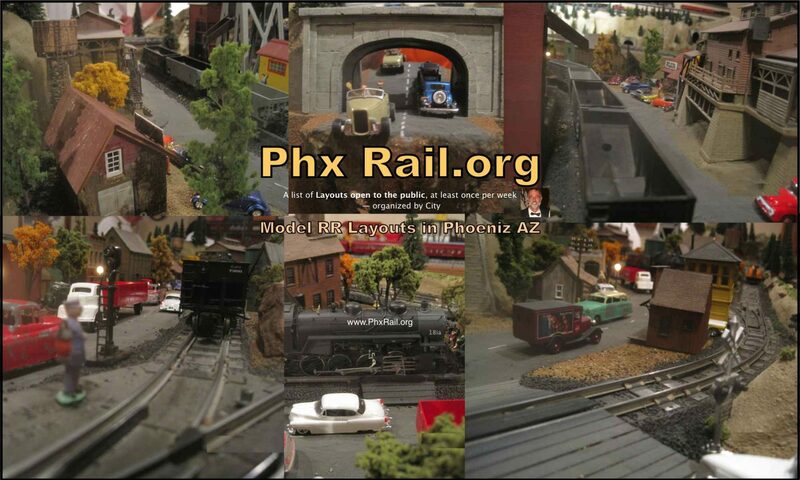 Section E lists the Arizona layouts and model RR clubs that are OUTSIDE the Phoenix area. Apache Junction: Superstition Mountain Museum Railroad, SuperstitionMountainMuseum.org/attractions/smmrr-railroad | The new ’50’ x 60′ layout opened Nov 2016, & operates several days a week in winter. The original small 12’x12′ layout is operated year round . Volunteers are Wanted to help operate these railroads. | Museum’s Youtube video | More photos are at DutchmansGulch.wordpress.org. Gilbert: Gilbert Model Railroad Club, HO ga. layout, GmrcTrains.com – 3rd Tue is “run night”. ** Arizona Model Railroading Society‘s N gauge layout, open to public on weekends, Click Here for photos, and Click Here to read about it. ** Arizona Model Railroading Society‘s Largescale outdoor layout, open to public on weekends, Click Here for photos, and Click Here to read about it. ** Sahuaro Central Railroad Heritage Preservation Society & Museum’s indoor Largescale layout, open to public on weekends, Several Layout Photos Here. that’s fourteen!) miles of 1-1/2″ scale live steam track, open to public on Sundays. Note: Expect to get LOST, as this hospital seems to be a huge MAZE. Mesa: Valle Del Oro, Garden Railway Club, Youtube Video. This layout is inside the gated Valle Del Oro RV park, but you can usually view it on Thursday morning during their “Country Store” hours. See the Valle Del Oro website events page to confirm. Click here to view several layout photos. ** McCormick-Stillman Railroad Park, TheRailroadPark.com – This park is open 7 days a week, and includes a 2′ ga. amusement park train, 1-1/2″ scale live steam, and O, HO, N, and Z gauge layouts. **N ga: Sun N Sand NTRAK MRC – sun-n-sand.org. **HO ga: Scottsdale Model Railroad Historical Society, ScottsdaleMrhs.org – operates a HO & HOn3 layout. ** O ga: Paradise & Pacific RR – PandPrr.com – operates a 3-rail O gauge layout. ** Scottsdale Live Steamers – ScottsdaleLiveSteamers.com – operates a 1-1/2″ scale, 7-1/2″ gauge ride-on layout. Sun City: Sun City Model Railroad Club, HO layout, suncityaz.org/recreation/clubs/model-railroad-club-of-sun-city , Richard Haworth’s narrated ‘Update #4’ Youtube video describes the layout. Layout can be viewed Tue., Thur, and Sat during winter months. Sun City West: Sun City West Model Railroad Club, HO, N, & G scale layouts, sites.google.com/site/scwmodelrailroadclub (and also railroad.scwclubs.com. Richard Haworth’s narrated Youtube video describes the layout. The HO and N layouts can be viewed Mon, Tue, Wed, Thur, and Fri. The outdoor largescale layout operates Tue., Thur., and Sat during winter months — see the schedule page. Surprise: Sun City Grand, Grand Central Railroad Park, Outdoor largesacle layout, GrandCentralRailroad.info and facebook.com/GrandCentralRailroad. Richard Haworth’s narrated Youtube video shows this layout in operation. The outdoor largescale layout operates Thur., Fri., and Sat during winter months — see the schedule page.